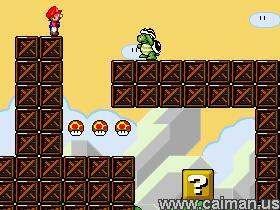 Caiman free games: Mario In Worlds Unknown 2 by Lord Spaceman. This Mario fan game is the sequel on the succesful Mario in Worlds Unknown. 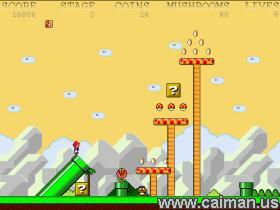 It is a nice game platformer with 13 levels, several bonus levels and a boss level. This game also features a Single Player Mode as well as a Multi-Player Mode. Super Mario can jump really high, but he can not kill any enemies and he can not transform to a better Mario, still the gameplay is good. The sound and music are not bad, but it causes the game to hang sometimes. So maybe it is better playing without music. It's a pity that there is no way to load/save a game. Authors home and download page .